The demise of handwriting in schools… my opinion (well, sort of). Mid-November, I received a phone call from a journalist from a popular Scottish tabloid. He explained that he was preparing an article about the demise of handwriting in schools and, since I am a calligrapher, he was interested in finding out my views on the topic. Since I teach calligraphy, and have also taught handwriting, it’s obvious where my alliance lies, and I would have been happy to simply write a few paragraphs for him, (not only in support of handwriting for school pupils, but for adults too), but he opted instead for a question and answer session. As his interrogation progressed, I got into the swing. I attempted to be interesting and amusing in my responses, offering anecdotes and personal experiences related to handwriting. After around ten minutes the journalist thanked me for my contribution and explained that the article would be published the following day. “You’ll need to buy a copy of the paper,” said my wife, but I didn’t agree. I was more than familiar with my own opinion on the demise of handwriting, so why would I want to pay to discover what was already there inside my head. As it turned out, I’m glad I didn’t buy a copy, since the article didn’t get published. I only found that out by surreptitiously leafing through a copy of the paper in my local Tesco. I wasn’t particularly disappointed by the article’s absence, so I put the experience to the back of my mind and moved on. Then, the week before Christmas, I unexpectedly received an email from the journalist. He confirmed that, after a delay, the handwriting article would definitely be published on December 21st, the final Sunday before Christmas. As before, I intended to read the entire article for free, but it was a full page spread, and my loitering was obstructing genuine newspaper-purchasers who tut-tutted me into submission. I reluctantly parted with my 80p, headed home, and settled down to refresh myself on my own views about handwriting. The premise of the article was that handwriting was becoming obsolete with the texting generation. It posed the question, “Do pupils’ illegible answers mean it’s time to axe written exams for tests on screens?” And there, halfway down the page, was a thumbnail-sized photo of yours truly, next to a large “NO,” with my views printed alongside. There was also a large “YES,” next to a photo of someone who totally disagreed with me. There I was, in print, at loggerheads with a complete stranger. I hadn’t expected the article to be presented in such a combative format. Nor had I expected my views to be be portrayed as if actually penned by me, and not the journalist. But I didn’t write that, was all I could think of as I read the article. Without the context of the journalist’s questions, my answers had become little more than a list of fragmented bullet points. The sentences were short, abrupt, and they continuously changed topic. My anecdotes were abridged, the grammar poor. The more I read, the more I cringed, and I was tempted to visit local newsagents to buy every available copy of the newspaper, just to prevent anyone I knew from reading the article. In despair, I showed it to my wife. “It’s not too bad,” she said, but her barely-disguised grimace told a different story. But maybe she was right. Maybe it wasn’t too bad. But it wasn’t me. It wasn’t my writing. And the views I had shared with the journalist now appeared stilted, disjointed, and tended to trivialise the seriousness of the subject matter. A featured quote leapt from the page, supposedly attributed to me, which I don’t even remember saying. “Writing is a way to stand out from the crowd,” I had apparently suggested, as if I considered penmanship to be, above all else, an antidote to anonymity. So maybe pupils should try it. Simply put away their keyboard… pick up a pen… and apply a little effort. The pleasure would be theirs for the taking. 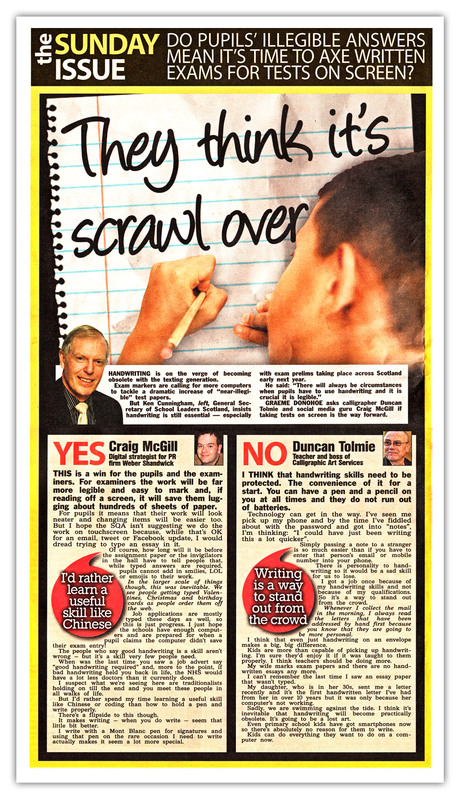 2 Responses to The demise of handwriting in schools… my opinion (well, sort of). I recently attended your beginners course Duncan so you can guess what my views on hand writing are! I think hand writing ANYTHING these days is met with the usual comment of ..why didn’t you just do it on the computer, much quicker and easier.. I disagree. when I started an Open University course a good few years ago I sent my first essay assignment to my tutor and it was hand written. My day to day hand writing is by no means hard to read, I’ve always written stand alone letters…not joined up writing as we said at school! Although I could do it that way, I preferred it my way and went through school constantly being pulled up on it…WELL instead of my tutor thinking WOW hand written( extra special effort in my naive mind) she asked if my computer was broken and said no students do them like that anymore and she preferred it printed!! After reading this article I asked my 18year old son his thoughts on it, to gain a different perspective. He is doing a degree at Glasgow University. Although he agreed that it’s just the way things are today and he has to submit things on line..BUT He doesn’t agree with just letting hand writing become a thing of the past. He often re writes notes from lectures and I’m happy to say shares my pleasure in finding the perfect pen or notebook..current favourite pen a PILOT DRAWING PEN 03….I am glad i seem to have passed on this passion to him! OK…I could go on forever about my love of hand writing and how special it feels to receive a hand written envelope through the post, I can tell who it’s from because hand writing is so personal. My Father died years ago and I recently came across a letter he had written to me years ago….It moved me more than anything else could because for that moment he was with me…letters on the paper physically written by someone who is no longer here…quite a special link to him I felt, a little bit of him. I think sadly that hand writing is dying out but maybe if there are enough people out there who share a love for it, we can keep it alive in our young people. It’s good to hear from you, and I’m delighted that your interest in calligraphy hasn’t waned since the beginners class ended. I agree with absolutely everything you say in your comments above and, uncannily, had an experience very similar to the one you had with your father’s letter. My mother died a few years ago, and many months after she passed away I was looking through some of her old photo albums that I’d inherited when I discovered a short poem she had written by hand. Although the photographs of her are special to me, the hand-written poem means so much more, simply because there is an actual part of my mother there within the folds of that scrap of paper. That’s when handwriting becomes precious! On the benefits of handwriting… almost thirty years ago, I applied for a job that I was not qualified for. But I got it. I was later informed that I was appointed simply because of my “beautiful handwriting” on the application form. So it’s safe to say that handwriting changes lives. Long may it continue to thrive. PS… Like you, I use Pilot Drawing pens for writing and adding hairlines to my calligraphy, but my preference is for the DR 0.1 because I like my pointed pens ultra-fine. Great pens, though, whatever the size! The dog walking by my side is not mine!